(Nanowerk News) Utilizing optical characteristics first demonstrated by the ancient Romans, researchers at the University of Illinois at Urbana-Champaign have created a novel, ultra-sensitive tool for chemical, DNA, and protein analysis. “With this device, the nanoplasmonic spectroscopy sensing, for the first time, becomes colorimetric sensing, requiring only naked eyes or ordinary visible color photography,” explained Logan Liu, an assistant professor of electrical and computer engineering and of bioengineering at Illinois. “It can be used for chemical imaging, biomolecular imaging, and integration to portable microfluidics devices for lab-on-chip-applications. His research team’s results were featured in the cover article of the inaugural edition of Advanced Optical Materials. 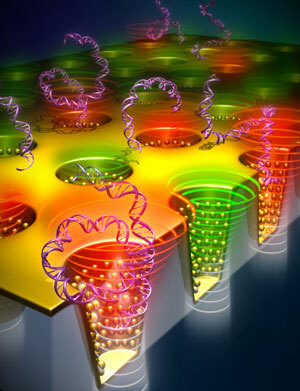 AOM cover art shows nano cup arrays. 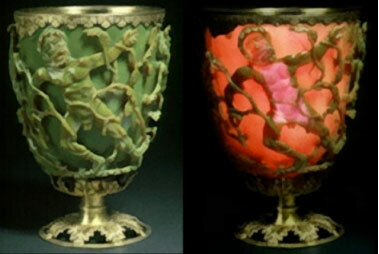 The Lycurgus cup was created by the Romans in 400 A.D. Made of a dichroic glass, the famous cup exhibits different colors depending on whether or not light is passing through it; red when lit from behind and green when lit from in front. It is also the origin of inspiration for all contemporary nanoplasmonics research—the study of optical phenomena in the nanoscale vicinity of metal surfaces. “This dichroic effect was achieved by including tiny proportions of minutely ground gold and silver dust in the glass,” Liu added. “In our research, we have created a large-area high density array of a nanoscale Lycurgus cup using a transparent plastic substrate to achieve colorimetric sensing. The sensor consists of about one billion nano cups in an array with sub-wavelength opening and decorated with metal nanoparticles on side walls, having similar shape and properties as the Lycurgus cups displayed in a British museum. Liu and his team were particularly excited by the extraordinary characteristics of the material, yielding 100 times better sensitivity than any other reported nanoplasmonic device. Colorimetric techniques are mainly attractive because of their low cost, use of inexpensive equipment, requirement of fewer signal transduction hardware, and above all, providing simple-to-understand results. Colorimetric sensor can be used for both qualitative analytic identification as well as quantitative analysis. The current design will also enable new technology development in the field of DNA/protein microarray. “Our label-free colorimetric sensor eliminates the need of problematic fluorescence tagging of DNA/ protein molecules, and the hybridization of probe and target molecule is detected from the color change of the sensor,” stated Manas Gartia, first author of the article, “Colorimetrics: Colorimetric Plasmon Resonance Imaging Using Nano Lycurgus Cup Arrays”. Gartia explained that light-matter interaction using sub-wavelength hole arrays gives rise to interesting optical phenomena such as surface plasmon polaritons (SPPs) mediated enhanced optical transmission (EOT). In case of EOT, more than expected amount of light can be transmitted through nanoholes on otherwise opaque metal thin films. Since the thin metal film has special optical property called surface plasmon resonance (SPR) which is affected by tiny amount surrounding materials, such device has been used as biosensing applications. According to the researchers, most of the previous studies have mainly focused on manipulating in-plane two-dimensional (2D) EOT structures such as tuning the hole diameter, shape, or distance between the holes. In addition, most of the previous studies are concerned with straight holes only. Here, the EOT is mediated mainly by SPPs, which limits the sensitivity and figure of merits obtainable from such devices. “Our current design employs 3D sub-wavelength tapered periodic hole array plasmonic structure. In contrast to the SPP mediated EOT, the proposed structure relies on Localized Surface Plasmon (LSP) mediated EOT,” Gartia said. “The advantage of LSPs is that the enhanced transmission at different wavelengths and with different dispersion properties can be tuned by controlling the size, shape, and materials of the 3D holes. The tapered geometry will funnel and adiabatically focus the photons on to the sub-wavelength plasmonic structure at the bottom, leading to large local electric field and enhancement of EOT.